St. Petersburg, Russia - ASCON Group is pleased to announced that open beta-testing of its new Renga Architecture was successfully completed at the end of February. The new AEC 3D CAD from ASCON is due to be released soon. The name "Renga" is based on a hieroglyph from the Land of Rising Sun, meaning "brick" - the oldest aspect in construction - but also the name for an ancient genre of collective poetry. Designing is, after all, a collective creation! The meanings are intertwined in the name of our new software: Renga Architecture is a simple yet comprehensive instrument for creating interesting architectural solutions. It combines an object-oriented approach with free modeling. The official release of the product will be very soon, and so ASCON can now report on the results from our beta testers. More than 550 people from all over the world took part in beta-testing - from Russia to Aruba Island in the Caribbean Sea. Designers, architects, drafters, university professors, and students of architectural and construction had the opportunity to review Renga Architecture during open beta tests conducted by ASCON for the last three months. During this period, more than 550 people from twelve countries took part in the beta testing. Beta testers shared with us their impressions about the new system, and gave us their ideas for its future development. Anna Zimich (Markovka, Ukraine), project "Cottage in 7 minutes". "I especially liked the option in Renga for editing buildings directly, without needing to change the building family's elements or libraries." 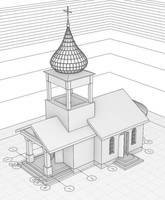 Roman Morozov (Izhevsk), project "Church"
"I was impressed by simplicity of the interface and navigation. Renga is easy to learn, and has a great way of working with levels or floors. I want to highlight the simplicity of using the Project Observer and its dynamic refresh ability." "It's very easy to be working on one level and at the same time to view results in 3D. Now I'm able to complete an entire project in two hours!" Leonid Platonov (Moscow), project "Recreation building with balconies"
"Renga architecture is an interesting program, because it lets me cast aside any thoughts about geometry, and concentrate only on the exterior and interior of the object to be constructed." "I noticed that the system makes modest demands on compute resources. It has fast and accurate object snaps, and selections of objects." "The main advantages I see to Ranga are its great interface, the ability to place windows in curvilinear walls, and the small file size of its models. The first impression I had from the system is good: all functions worked correctly, with no mistakes. The system never crashed on me." "Renga has interesting method of working: It begins with 3D surfaces, and then after it develops plans and facades, and not vice versa. The program is intuitive to understand; you can learn it in several hours. This system is good for placing several projections on one printer sheet, such as facades, sections, and plans. It shows lines with the correct thicknesses; this is very convenient, as we don't need to adjust thickness of lines." Members of ASCON Software's Internet forum also showed their creativity. These are some of the projects created in the beta version of Renga by VNVR and Alchemist. Renga Architecture development team is thankful to everyone who participated in beta-testing of the new product and promises to take into account all the recommendations. Are you interested in Renga? Do you want to try this new architectural software? Be prepared to meet Renga Architecture this spring!